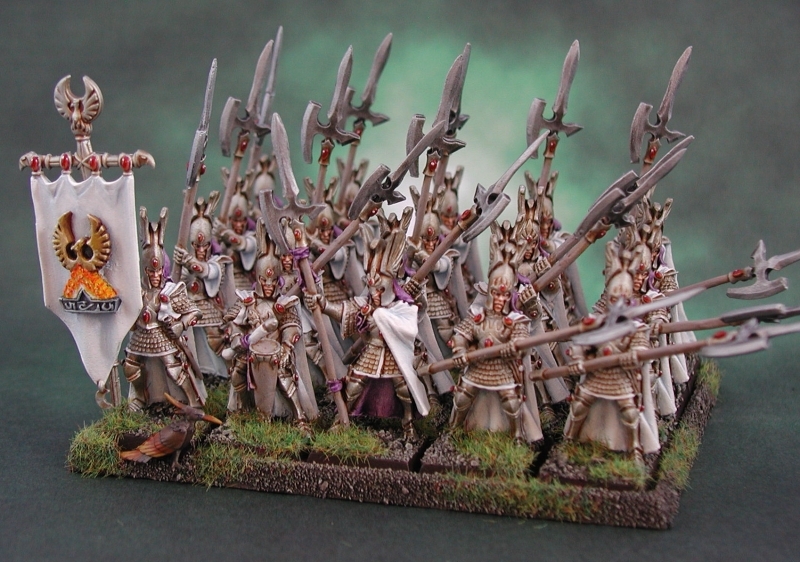 An army-wide photo of my completed army, resplendent in their gold and white, with purple as a spot colour. 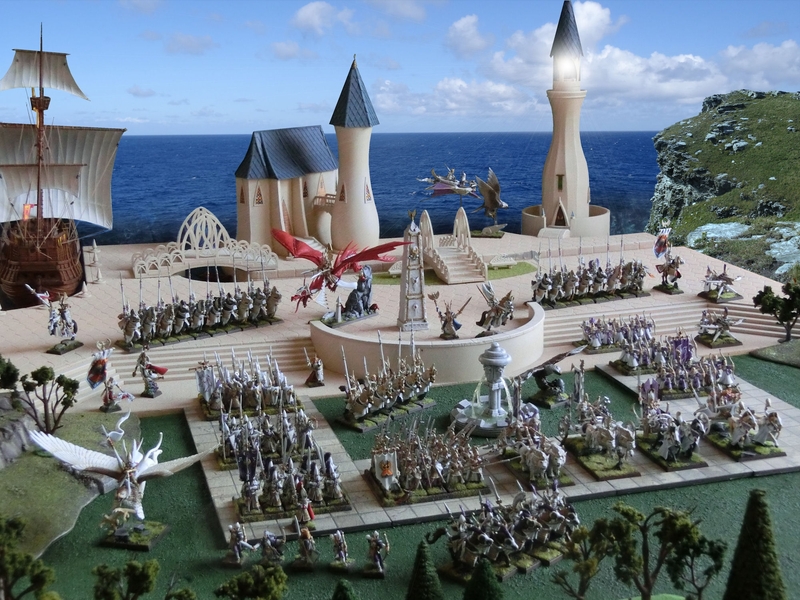 They are arranged on the High Elf port board, totally not ready for battle. After all, it's much more important to look good than actually win your battles, right? It's not actually a very big army, but I've got units for most of the entries in the army book, and I am very pleased to have finally finished them at long last. I have a nice 20-strong unit of Silver Helms, complete with Noble (back left), Mage, Battle Standard Bearer (back right) and of course Prince Tyrion (back centre). I also seem to be blessed with an over-abundance of chariots (? 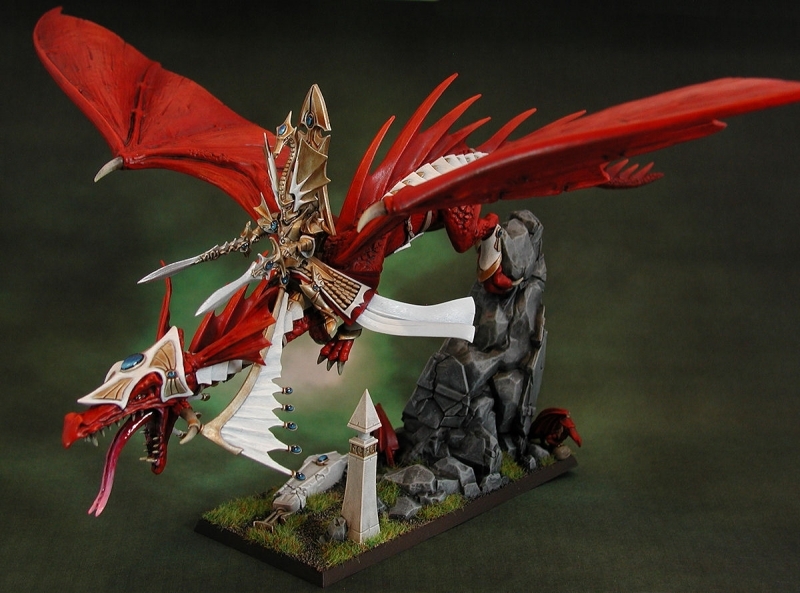 ), so maybe one day I'll have to try an all-mounted army list! 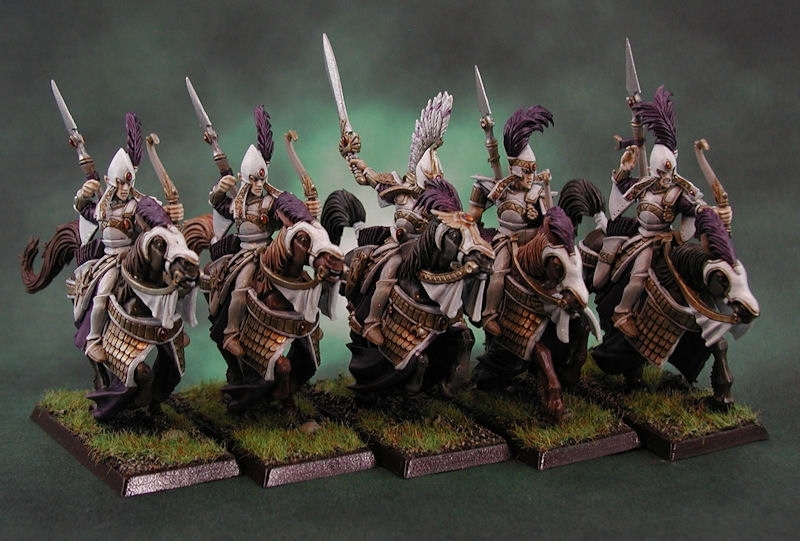 So far I've only painted a few basic units for this army, because, quite honestly, they're not very exciting to paint. So I'd rather get them out of the way, before I can reward myself with the cool stuff - like dragons! I chose a fairly quick method for my paint scheme (with an eye to the 100+ boring core models I had to get off my desk first). Paint the metallic bits mithril silver. Shade the white armour with space wolf grey in only the deepest parts. This is the leader of my force in hero-level games. Being a whinging ponce, I can imagine him insisting on deep red instead of the common-as-muck purple everyone else wears. With only 3 colours (white, gold, red) on the model, I was able to brighten up the base with a rainbow-coloured magical swirly bit. Lovely to paint, this model. 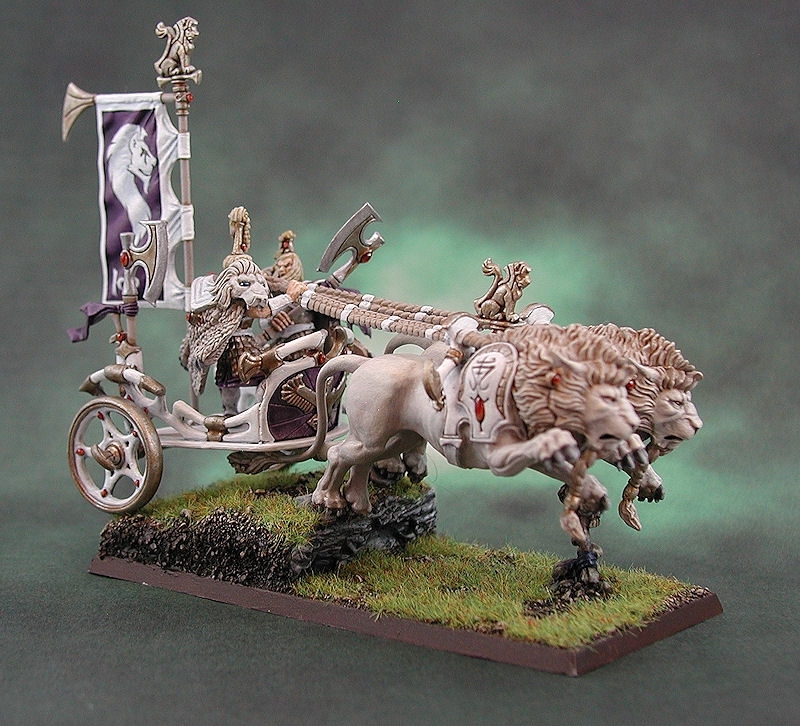 Regular army-wide colour scheme for the chariot and riders, and the lions were painted to match. They were basecoated with dheneb stone, the hair was washed with gryphonne sepia, and then everything was highlighted up with my special pale flesh mix. You can't really see from this photo, but when in combat this chariot has massive height - the lions really look like they're leaping clear over the enemy! The banner is a freehand copy from the army book. 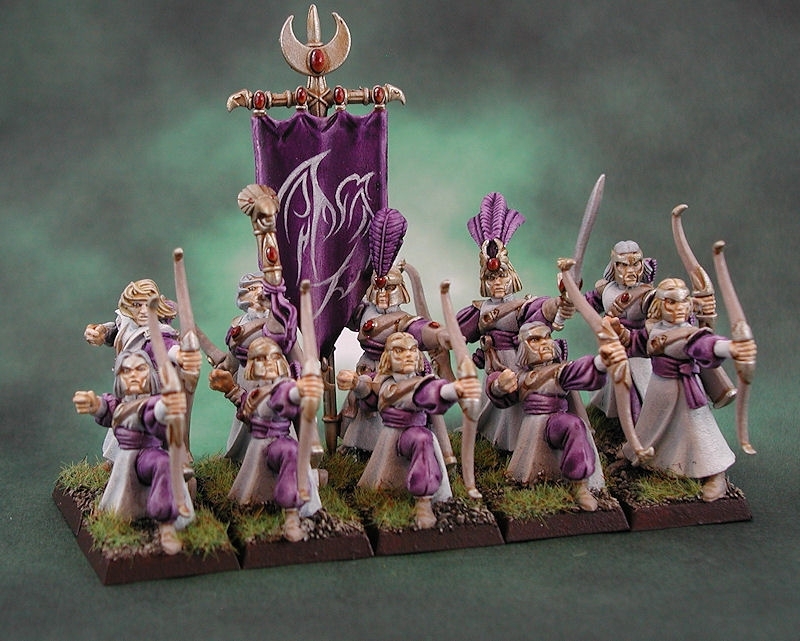 The purple on this unit is duller, because they were undercoated with light grey rather than white. On reflection, I prefer the white for a brighter purple. The horses were double washed in browns and blacks straight on to the light grey undercoat, which worked really well. Heroes, every one of them! In smaller games, I use the champion as my general, coz he looks so cool. 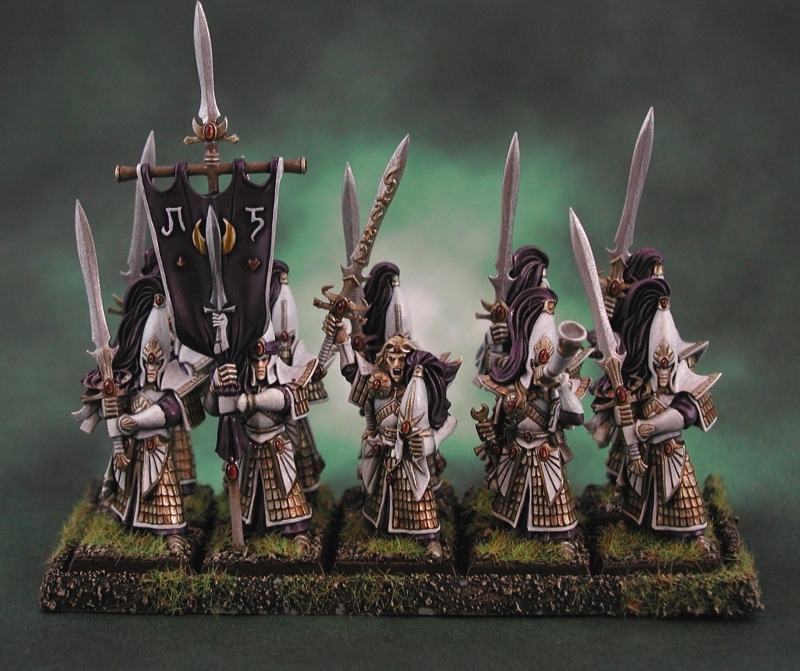 This was the first unit completed, and gave me the chance to see if the colour scheme worked. I liked it mainly because it was different from the white/blue/silver you see everywhere.This was also an early attempt at non-metallic metals, on the banner. 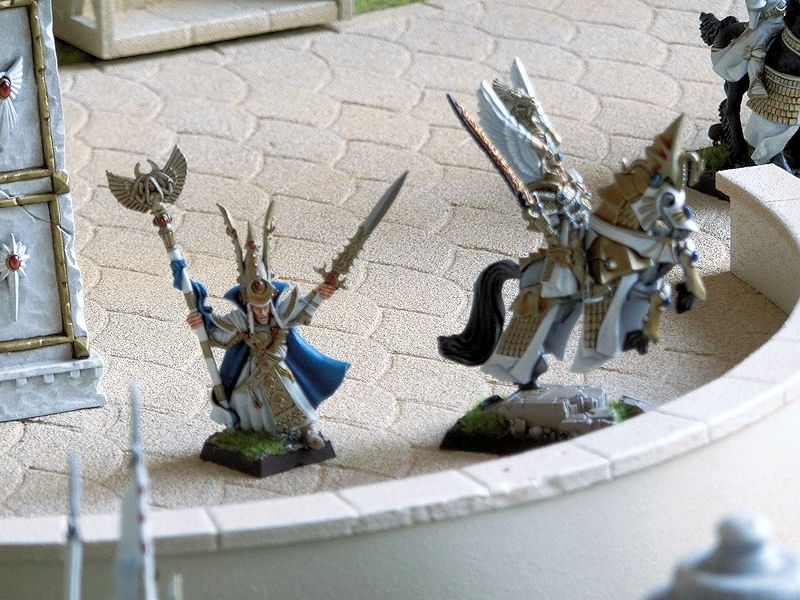 This unit looks really pale, as the helmets don't have feathers or plumes, so it's just loads of gleaming white. Rather awkwardly posed models, but they look good as a unit. The horse motif on the banner was based on a tattoo design I found on google. The command group models are metal ones from 20 (?) years ago, and they still fit perfectly! I really should've used a white undercoat, eh? Those purple bits just don't have enough definition. Ah well, don't use them much anyway. 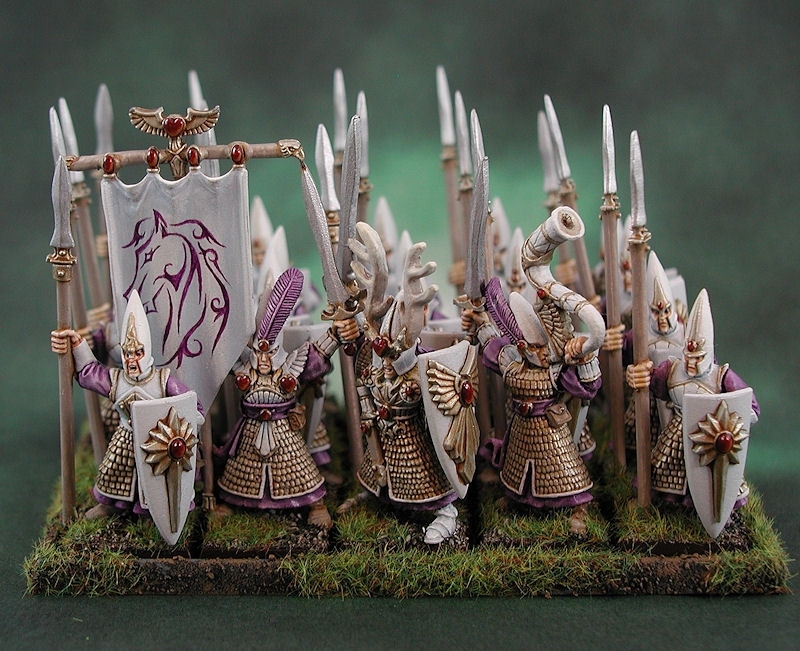 I mean, what use is a 10-strong unit of spearmen that is only 2 ranks deep?! Sheesh, these have to be some of the dullest models to paint. There are only about 3 different heads available, and I had to paint 30 of the buggers. Thank goodness for the bits box, eh? At least they were quick to paint. The banner motif was, of course, another googled tattoo design. UPDATE - At long last I finished painting these old-style metal Phoenix Guard. I had to swap the banner for something that wouldn't snap off every time, and I had to add a metal plate to the movement tray so the magnetized models wouldn't keep toppling over. Very heavy unit, this! 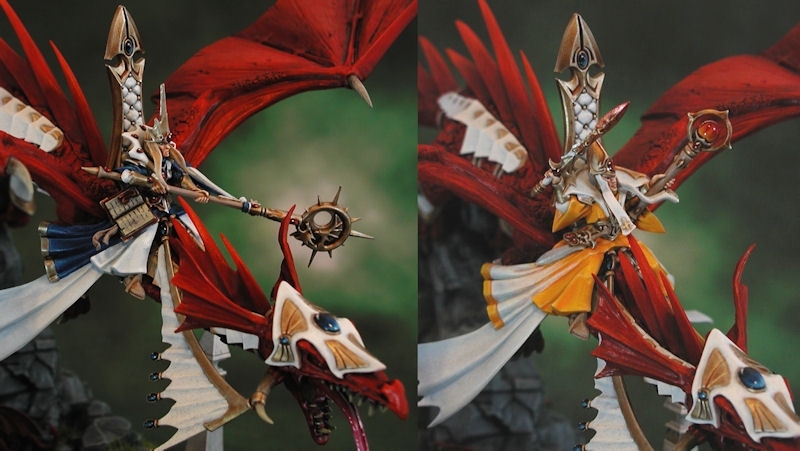 I covered the Phoenix Guard in head-to-foot gold plate, with clean white cloaks, to denote their elite status. 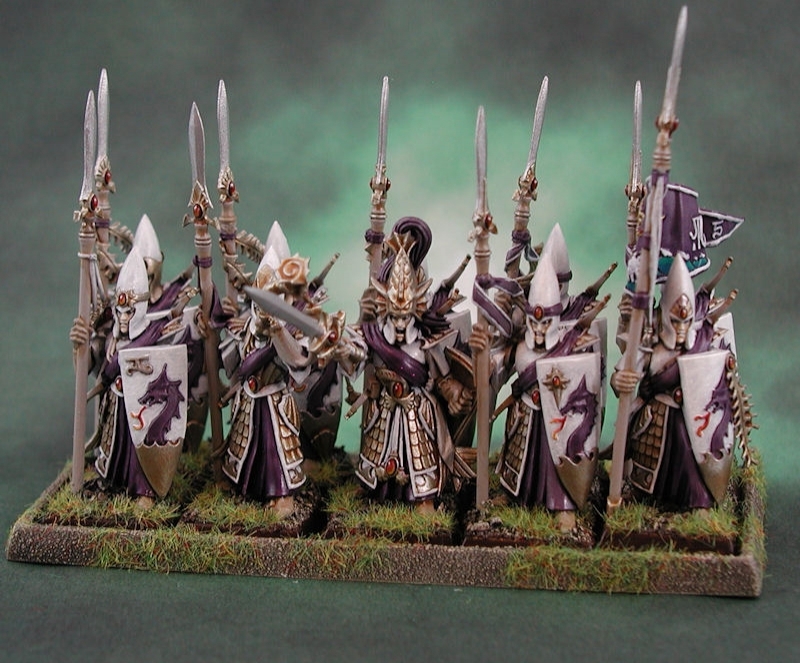 I have just finished the very last models for my High Elf army, so it is at long last fully painted!! Well, at least until I get more, eh? 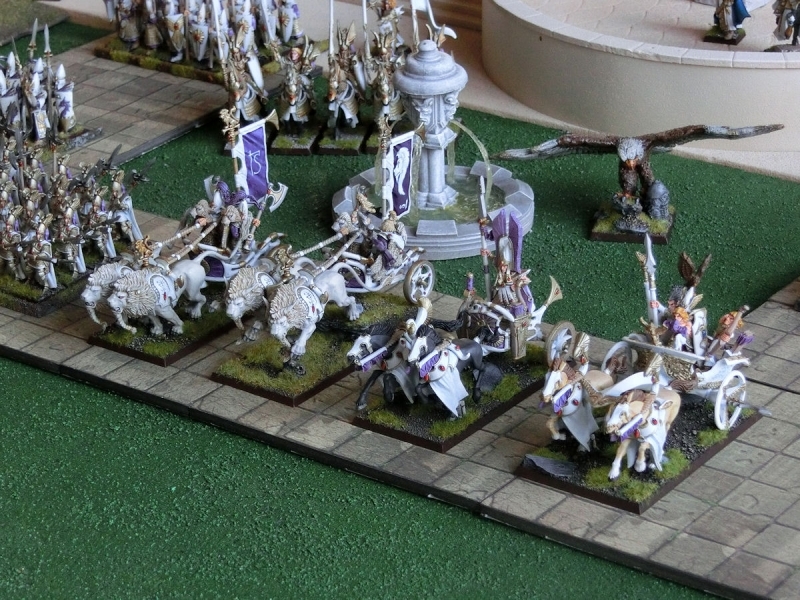 Anyway, I have managed to get a big scenic photo of the whole army, and here are 4 of the 5 chariots. 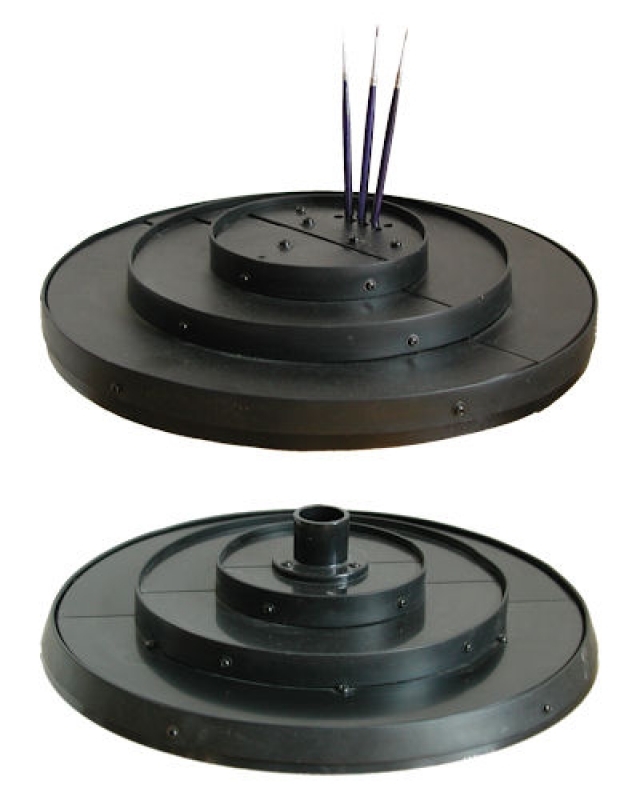 The two chariots on the right are both being used as Tiranoc chariots, but both are in fact much older models. The elf with a massive helmet feathers is some rich noble, no doubt, but I still really like the super-old chariot, which manages to fit in 4 passengers, and a chest of gold!! It's a really old model, and in very heavy metal too. I simply swapped the 4 undersized metal horses for 2 more modern plastic replacements. 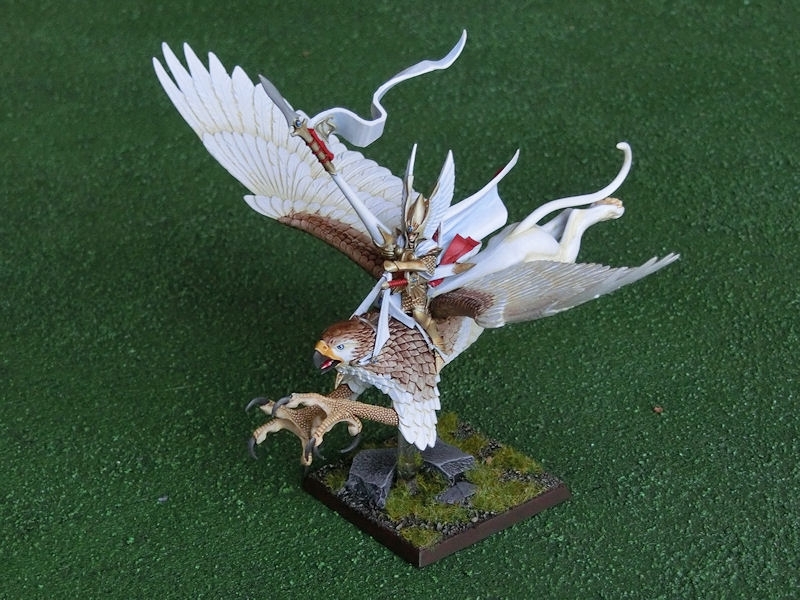 I've been using this griffon rider model as the club tournament trophy for the last 3 years, so I thought it was about time I actually painted up this spare one for my own army. It's a very, very pale version of a white lion-type cat, with my normal gold and white scheme with red accents for heroes. 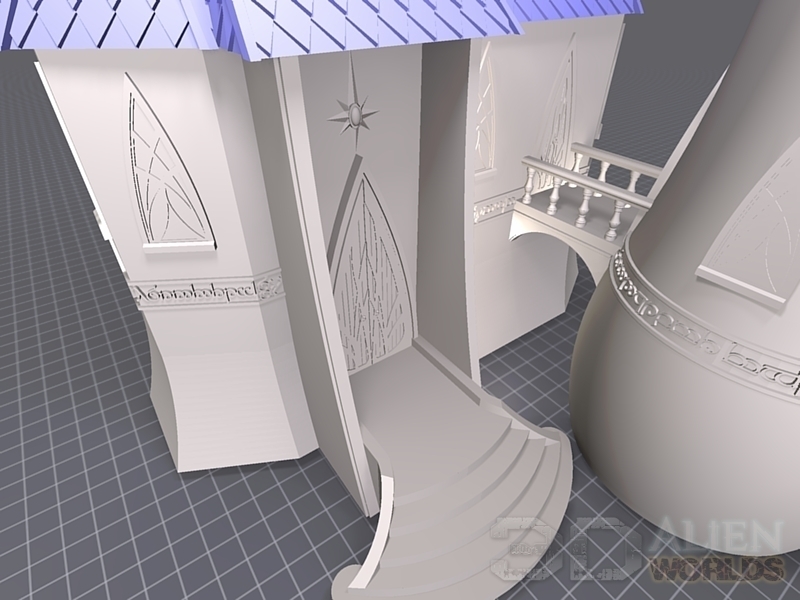 Last, but not least... Teclis was the very last model to be completed. 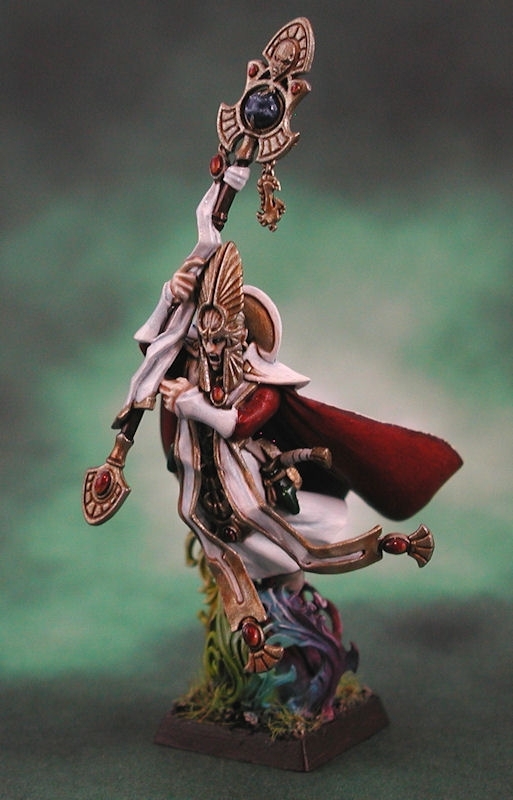 I've used the same white and gold scheme for him, with blue to denote his skill as an archmage. I really am quite tired of painting white, now! The Prince Tyrion model received a more modern hero-horse body, but Tyrion himself was left untouched. Gotta love that hat! !